One of the benefits of being and outdoors eatery is that we can also be a dog friendly restaurant without bothering other patrons too much. The benefit of being outdoors, as you can imagine is that with the natural breeze that occurs, you don’t have to worry about the doggy smell that comes with them. Additionally, because we are outdoors, you will have more freedom to let your pup wander without it being confined. We love animals, and believe that your four legged, furry friends deserve the same experience that you are taking part of. It can be difficult finding a place to take your dogs for a meal when you are out for the day with them. 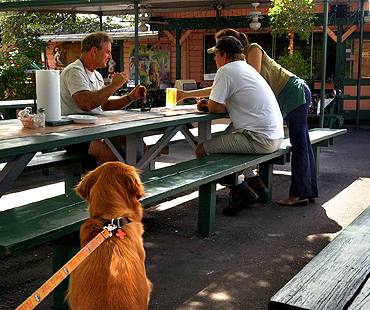 In large part, because we are right off the Pinellas Trail, we welcome guests of both human and canine variety because we know that everyone needs a cool drink after a long run, and a hearty meal to burn energy when you are done. All you have to do is find a good looking table on the patio and sit down. We will help you with the rest, and if you need extra air, then you can sit by one of our many fans and cool off faster.